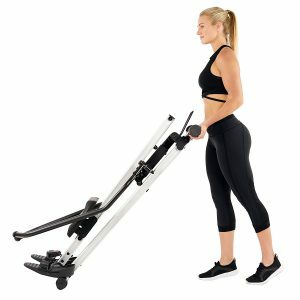 Sunny Health & Fitness SF-RW5720 is a brand new release incline full motion rower with an innovative design and a 350-pound total user weight capacity. The current price on Amazon.com seems very reasonable for what it offers in terms of solid build quality and functionality and how fast it can help you lose weight and get in shape. When you start rowing the sturdy aluminum rail that the seat will slide on will incline each time you pull the handles. It will be forcing your legs to push against gravity and work all parts of your body, especially your core section and leg muscles, not just your back. You’ll get a great arm and quad workout. It has the anti-slip comfy grip ergonomic handles that you can’t find on conventional rowers, for a full motion and realistic feeling rowing. Sunny Health & Fitness SF-RW5720 is compact in size and weighs only 39 pounds and measures 55 x 22 x 18 inches. You can fit it easily in your home workout area or relocate it by simply tilting and rolling it on its front wheels if you don’t have a lot of space and want to get it out of the way. You do not need to do any heavy lifting but 39 lb. is not a lot of weight either. It is shipped almost assembled with only pedals and the handles to be attached by you. You can actually adjust the incline to five different levels up to 30 degrees or a 17” of maximum incline. And you can get a less or more challenging workout depending on your mood or what you can handle at the time. It comes with a large (15 x 12 inches) and fully padded comfortable seat for longer workouts and large textured non-slip pivoting pedals with straps to keep your feet stable and in place. There is a digital LCD console with the stats like calories, time, reps per minute and total count as well as Scan that moves between each of these indicators. The incline on this rowing machine is similar to walking or jogging at an incline. Each time you row with your arms, the 29.5-inch aluminum slide rail moves up as a response. The quads, calves, feet and ankles and the LPHC- Lumbo Pelvic Hip Complex are activated and used more with the movement of the arms. And the upper body is for stabilizing your body in your up and down movements. You can perform a variety of complex exercises working on different parts of your body easily, without any complications. There is a tablet holder that you can put your iPad, Android tablet or smartphone for entertainment, so you do not get bored and can go for longer. You can enjoy a quiet workout as the seat slides silently on the rail. The only time you will hear any noise on this rower is the click when you change the resistance levels. Despite its compact size and lightweight, it supports an impressive amount of user weight of 350 pounds. Sunny SF-RW5720 is good for an effective cardiovascular and resistance training. You will certainly feel a deep burn and get sore muscles in your legs, arms, shoulders, back and abs, especially at higher incline levels. It is certainly more useful than regular rowing machines and offers more benefits. But it can get quite challenging and will be hard for you to row for as long as you might on regular rowers. This also means you’ll burn more calories and get in shape in a shorter period of time. What you can do is take breaks in between and continue rowing. You can use it comfortably every day and may save you on money and time by not going to gym.